Serves 6. This recipe freezes well. Knead the mixture, then roll out on a floured surface to an oblong measuring about 10×4 inches. Fold in three, then give it a half turn clockwise. Repeat the rolling and folding process twice. Wrap and chill. In a bowl place the grated rind of the lemon, 2tbsp of lemon juice, 2oz of brown sugar, the cinammon and semolina. Stir well. Peel, core and chop the apples into large pieces. Stir into the bowl with the blackberries. Roll out two thirds of the pastry and use to line a 7½ inch pie plate. 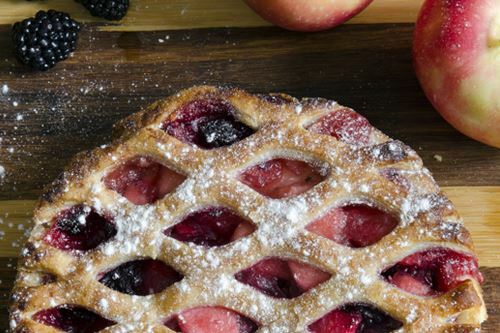 Pile the fruit mixture into the dish then decorate with a lattice made from the remaining pastry. Stand the dish on a baking sheet. Bake at 400F/200C/Gas 6 for about 15 minutes or until tinged with colour. (Optional – remove from the oven and brush the pastry with beaten free-range egg white and sprinkle with caster sugar.) Bake for a further 25 minutes, covering lightly with foil when well browned.